Engagement Accelerator - What fuels your engagement? The Engagement Accelerator is a simple 13-question assessment examining key preferences that can affect employee engagement over time. With reports for individuals and managers available, it's a perfect snapshot of engagement principles for employees and teams. According to Gallup, up to 70 percent of variance in an employee’s engagement is directly related to the relationship with his or her manager! The Engagement Accelerator provides talking points to help build this critical relationship. Surveys and personality tests can be complex and time-consuming to complete and implement. Instead, the Accelerator offers immediately relevant leadership advice... and rapid returns in self-awareness. It's easy! The Accelerator presents 13 statements related to engagement, each with two extremes of preference. You'll be asked to rank them on a scale of 0-7 according to how strongly they relate to you. Unlike other assessments, the Accelerator's questions do not reveal personality or competencies, but inclinations and preferences regarding communication, recognition, and work approach, among other topics. The narrative descriptions provided by the Accelerator have been rated as 96 percent accurate! They provide a great starting point for understanding between managers and employees as well as among teams both small and large. 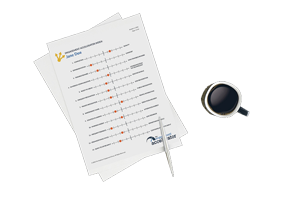 Once a manager is familiar with the Engagement Accelerator and its results, the easy-to-understand reports can serve as a quick at-a-glance refresher on how best to engage an individual employee. They're the engagement "gas pedal!" SIX MINUTES... TWO REPORTS. COUNTLESS INSIGHTS. The Engagement Accelerator is a perceptive assessment designed to identify key engagement drivers and preferred work styles. Based on more than 30 years of engagement insights and conclusions by noted employee engagement thought leader and author Bob Kelleher and his team of organizational development practitioners, the Accelerator investigates 13 categories to provide a snapshot of an employee’s work preferences. The Accelerator generates two reports – one for the employee, and one for the manager. These provide a narrative overview of the results as well as discussion points for a targeted follow-up meeting to foster in-depth understanding between manager and employee. Preferences are weighed on a scale of 0-7 total possible points. Test your whole organization or a single department with flexible pricing. Your Accelerator access is validated with your email address and keycode. The Engagement Accelerator is great for teams both small and large. Please contact us for more information or to arrange the right package for your organization. The Employee Engagement Group helps organizations shift the dial from potential to performance by promoting a shared vision where each employee has a stake in the outcome. We believe that an engaged culture is the key to untapped creativity, real innovation, mutual accountability, and measurable results. When people bring their hearts and minds to any endeavor, it feels less like work and more like an adventure where the sky is the limit. © Copyright 2016 by The Employee Engagement Group.